Jeromey Clary (born November 5, 1983 in Norfolk, Nebraska) is an American football offensive tackle for the San Diego Chargers of the National Football League. 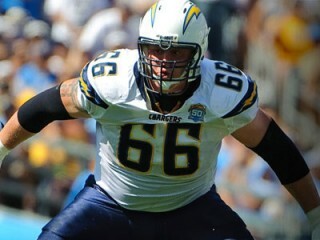 He was drafted by the Chargers in the sixth round of the 2006 NFL Draft. He played college football at Kansas State. Clary was having one of the best seasons of his career in 2009 when it ended early as result of a serious ankle injury late in the Chargers’ Nov. 22 game at Denver. He had started the first 10 games and the line was collectively playing some of its best football when the injury struck. In fact, the Bolts rushed for a season-high 203 yards and didn’t give up a single sack in the Broncos game. Clary spent his entire offseason in San Diego and fans should expect a full recovery for the 2010 season. Clary’s career took off in 2007. A reserve most of the season, Head Coach Norv Turner inserted Clary into the starting lineup at right tackle in early December to give the team’s struggling running game a spark. Over the final five games, the Chargers rushed for 880 yards and eight touchdowns. Not surprisingly, the Bolts went 5-0 during that stretch. Clary and wife, Breanna, had their first child, son Cannon, in March 2009. Besides being a dad, Clary’s hobbies include playing golf and spending time at the beach. TRANSACTION HISTORY: Sixth-round draft choice (187) by Chargers, April 30, 2006...signed four-year contract, July 25, 2006...waived Sept. 2, 2006 and re-signed to practice squad, Sept. 4...re-signed one-year contracts Jan. 16, 2007, March 25, 2008, March 16, 2009 and April 15, 2010. 2009: Game Ball from coaches after OL had best game of season to date, Oct. 25 at KC, blocking for 135 yards rushing and allowing no sacks in 30 pass plays...earned another Game Ball for gutty effort in Denver Nov. 22, blocking for season-high 203 yards rushing and allowing no sacks in 22 pass plays before leaving game late with ankle injury that landed him on “Reserve-Injured” Nov. 25. 2008: OL outstanding in win over NE Wk 6, allowing no sacks in 306-yard, three-TD passing game…Dec. 14 at KC, line gave Rivers time in 4Q to go 19 of 25 with two TDs and no INTs in 22-21 win after trailing 21-10…helped block for team-record 289 yards rushing in AFC- West clinching win over Denver Dec. 28…previous mark was 287 yards on Oct. 13, 1963…OL keyed 167-yard rushing night in Jan. 5 AFC Wild Card Playoff win vs. IND as Bolts scored game-tying FG late in 4Q and scored game-winning TD on 22-yard run in OT. 2007: First-career start in Lambeau Field at RT Wk 3…moved into starting lineup Dec. 2 at KC and had key role in 191-yard rushing day as Bolts broke 10-10 tie at half with rushing TDs of 31 and 28 yards…line helped block for 274-yard rush game vs. Detroit Dec. 16, then second-most in team history…also allowed no sacks vs. Lions…OL allowed one sack in 31 pass plays in Wild Card win over Tennessee Jan. 6…no sacks allowed in Jan. 13 AFC Divisional Playoff win at IND and OL had perfect blocks as Billy Volek scored game-winning TD on one-yard QB sneak. 2006: Spent entire season on practice squad. COLLEGE: Second-team All-Big 12 as junior and senior… invited to 2006 East-West Shrine Game…three-time (2003-05) Academic All-Big 12…KSU Lineman of Year as junior and senior Lifter of Year, Scholar-Athlete of Year and Paul Coffman Award for outstanding leadership, attitude and improvement as senior…also team’s Outstanding OL...played at KSU from 2002 05…psychology degree. PERSONAL: Born in Norfolk, Nebraska…all-region, all-area, all-district and academic all-state at Mansfield (Tex.) HS… Offensive MVP as senior...Coca-Cola All-Star Game invitee. View the full website biography of Jeromey Clary.